Android phones aren't the only handsets that have access to a free, full-featured GPS application. Nokia on Thursday announced that it will make the premium version of Ovi Maps, which includes turn-by-turn directions and traffic alerts, available on a number of its devices free of charge. But not all of Nokia's devices will benefit from the free upgrade from the start. Nokia's move seems clearly designed to counter Google, which made its free Google Maps Navigation app available in the 2.0 version of the Android operating system last year. The GPS app, which offers turn-by-turn directions and other gimmicks such as street and satellite view, was initially available only on the Motorola Droid, but has since been made available on more Android handsets. Nokia took this idea a step further and is now offering for free its premium Ovi Maps app, with turn-by-turn directions for 74 countries in 46 languages. Unlike Google's wireless connection-dependent Google Maps, Nokia's Ovi Maps can operate completely offline, as the maps are stored on the device. 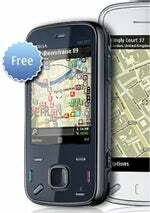 Only 10 GPS-equipped Nokia models will get the free premium Ovi Maps: the N97 Mini, 5800 XpressMusic, 5800 Navigation Edition, E52, E55, E72, 5230, 6170 Navigator, 6730 Classic and X6. The obvious omission from this list is the N97 model, Nokia's previous flagship device, which could make many of its users (mainly early adopters) unhappy. Also missing from the list is the Nokia N95. UPDATE: Nokia N97 users will soon receive the free premium Ovi Maps as well. Doug Dawson, Director of Communications, Devices and Services at Nokia told PCWorld that "the N97 requires a slightly different configuration, it was not included in the initial list of devices, but support for the N97 will be added very soon so they too can take advantage of the benefits of navigating the world for free." Still, Nokia's plan to give away the premium Ovi Maps feature is a good start. The Finnish company acquired Navteq in 2007 and banks on the increased use of mobile GPS applications, which judging after the latest freebie, it wants to take part in. Around 20 million Nokia devices will receive the free upgrade, which could dent profits of the likes of TomTom and Garmin.